Hannah was invited to a princess birthday party (again, pretty much the only 4- and 5-yr old theme, but who can blame them for wanting to dress up). We don’t have a very big dress-up collection, do I decided to make something resembling a princess dress so she’d have a fun new outfit. After much Googling (I don’t do Pinterest), I found the Urban Princess Dress. It seemed easy enough to finish in an evening, and it was super cute without froo-froo and bows. 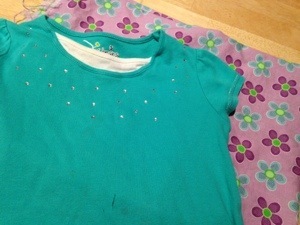 Another plus – the top of the dress is a cut-off tshirt. It just so happened that the week before, Hannah had an unfortunate scissor accident and cut a hole in the front of one of her shirts. 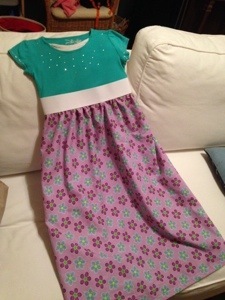 I cut the shirt off above the hole, and it was perfect for the princess dress. We picked out some fabric at the store to match as well as some matching thread and wide elastic. Those were the only supplies – easy! I followed the tutorial as listed on the blog. I found the directions to be pretty clear, and the only time I had to redo a seam was my own carelessness. In less than two hours, I had a dress! I immediately noticed the skirt on my dress was nowhere near as full as the skirt in the photos on the blog. I don’t think she gave accurate dimensions of the pictured dress. But I was still happy with how it turned out. And Princess Hannah loved it! 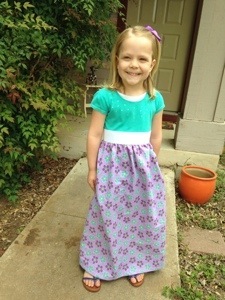 She feels very fancy in the long skirt. I see some of the store-bought princess dresses, and they seem so flimsy that they’d fall apart if you actually tried to play in them. This dress lasted fine through the super-fun birthday party as Hannah was climbing on a swing set, having sword fights and chasing a dog. And there has been much playing since then. This was a fun sewing night, and I’d recommend the Urban Princess Dress tutorial for anyone wanting a cute dress project. This entry was posted in Family, Fun by Diana. Bookmark the permalink. In looking at the photo of the original, I would say she used at least 3x the waist measurement for the fabric! Possibly even 4x depending on the weight of the fabric. Very cute, indeed!